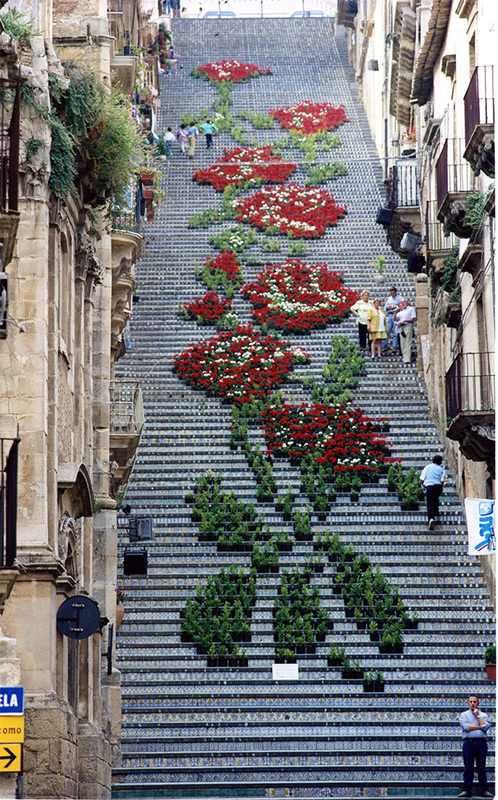 Share the post "Thousands of Potted Flowers on a Staircase in Sicily"
Plan a trip to a small town on the island of Sicily called Caltagirone, about 70 km southwest of Catania, and you’ll witness a landmark that’s a sheer beauty. The Staircase of Santa Maria del Monte, was built in 1608. It has 142-steps which are each decorated with a different ceramic tile, using styles and figures derived from the millennial tradition of pottery making. This breathtaking staircase that connects the high part of the city to the low part, is the center of many cultural events in Caltagirone. Caltagirone is famous for its craft production of pottery, a job that still employs many craftsmen. This ancient art has developed over the centuries, but has maintained practically the same decorations and colors so typical of Caltagirone pottery. Virtually all buildings in the old town, palaces, churches, monuments, gardens and squares are decorated with ceramic tiles. The town’s name Caltagirone derives from Arabic, underlining the influence of the ninth century Arab settlers who introduced new ceramic production techniques, such as glazing, which still characterise the local style. 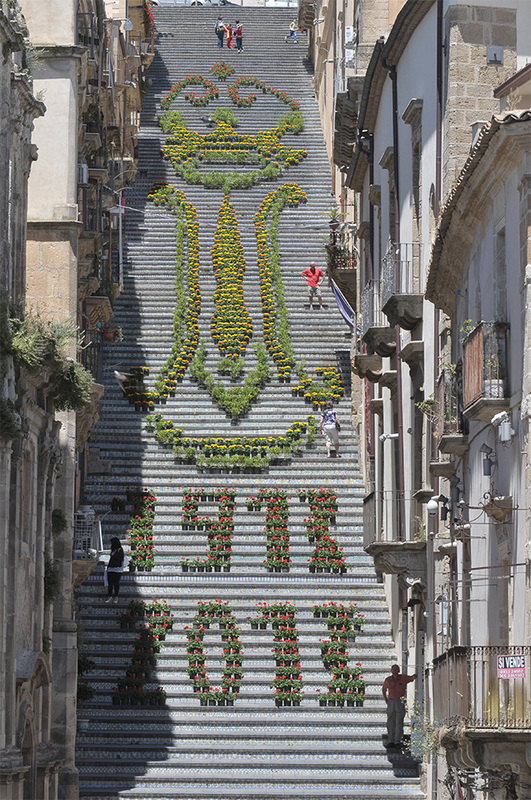 Every year, usually through May to June, the town celebrates La Scala Infiorata, La Scala flower festival of Caltagirone. 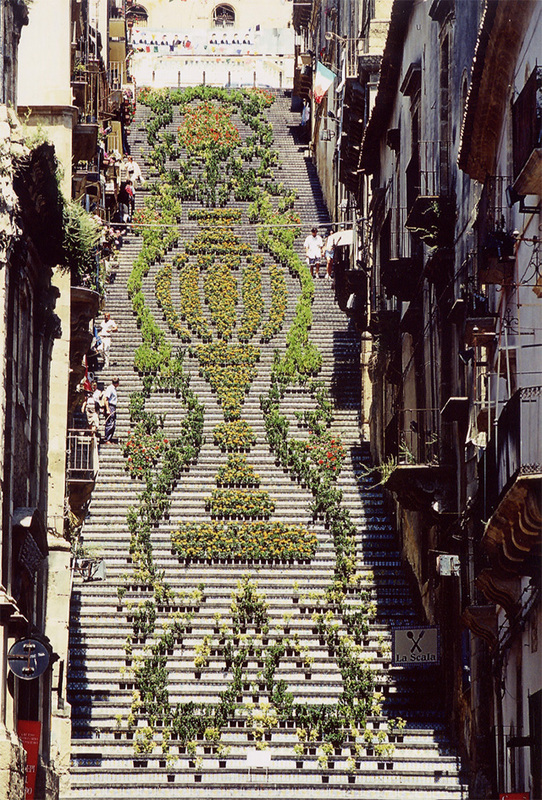 During this period the Staircase of Santa Maria del Monte is decorated with hundreds of potted plants and flowers of different colors which are arranged to create a beautiful one grand design. 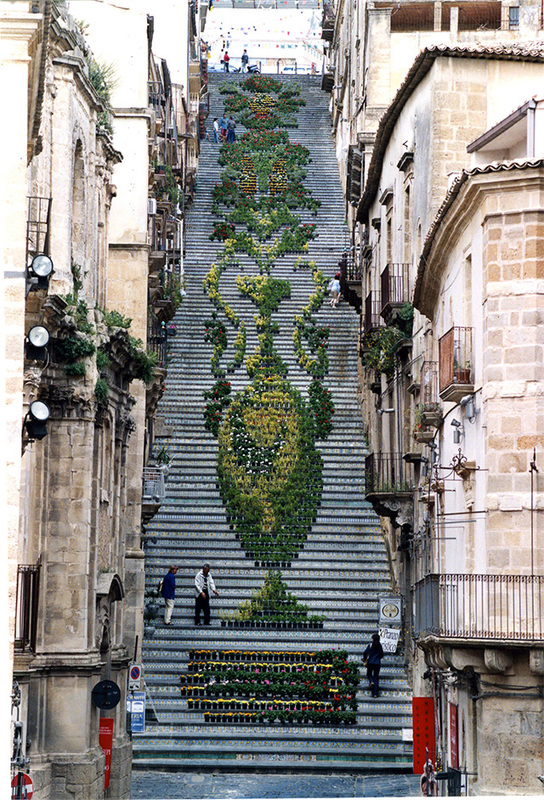 La Scala Flower Festival is held as a tribute to Our Lady of Conadomini, who is patron and protector of the city of Caltagirone. 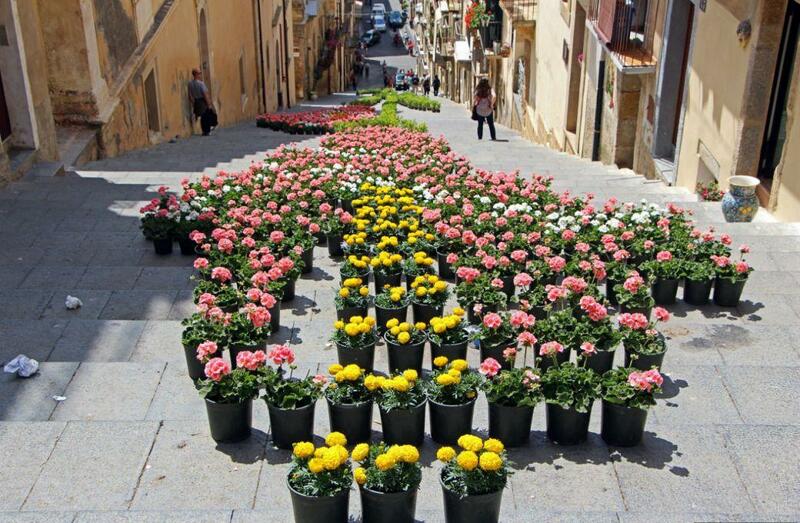 Tourists from all over the world are invited to Sicily’s pottery town to admire the floral designs that stretches from the bottom of the stairs all the way to the top. They can even walk through the maze of potted flowers and see every detail up-close. In 2013, for example, the floral design decorated the staircase for almost a full month, from May 8 to June 3, so that visitors could admire the grandeur of its scale. Created by Angelo Murgo, it was comprised of 2,000 plants and flowers which included geranium, marigold and boxwood. In 2015 it was from the 19th of May to the 15th of June. Check out the Festival dates on the town’s page if you are planning a trip to Italy next year!